MIG contact tips are compatible with "Forney" (00306 and 00308), "Tweco", "Binzel" or "Clarke" MIG guns. It is precision machined. 4-pack. Useful marking tool featuring a handy pocket clip, knurled aluminum handle and tungsten carbide tip. Cuts glass. Replacement MIG contact tip for "Hobart Handler" 135, 140 ("Forney" 00355), 175 and 187 ("Forney" 00356) and "Ironman 210" ("Forney" 00362) and 250 ("Forney 00361). 3-pack. Replacement MIG contact tip for "Hobart Handler" 135, 140 ("Forney" 00355), 175 and 187 ("Forney" 00356) and "Ironman 210" ("Forney" 00362) and 250 ("Forney 00361). 3-pack. Replacement MIG contact tip for "Hobart Handler" 135, 140 ("Forney" 00355), 175 and 187 ("Forney" 00356) and "Ironman 210" ("Forney" 00362) and 250 ("Forney 00361). 3-pack. For Hobart, Handler 135, 140 (Forney 00355), 175 and 187 (Forney 00356), and Ironman 210 (Forney 00362) and 250 (Forney 00361). 3-pack. Includes 2 barbed hose splicers and 4 hose ferrules. Tempered steel chisel to resist dulling during heavy duty usage. Impact resistant handle. Removable and replaceable brush (Forney 70501) for cleaning. 12" (304.8mm) overall length. 2" (50.8mm) face with 1/4" (6.35mm) national pipe thread (NPT). Features threads that are common to "Forney", "Victor", "Harris", "Smith" and "Marquette" compatible regulators. 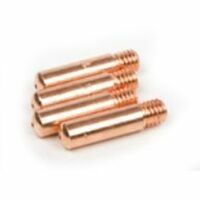 Solid brass threads and brass casings provide extra long life. "Harris" compatible oxy-acetylene cutting tip. Fits "Forney" 01687 torch kit and similar "Harris" compatible medium duty equipment. "Harris" compatible oxy-acetylene cutting tip. Fits "Forney" 01687 torch kit and similar "Harris" compatible medium duty equipment. Features copper shells machined from solid bar stock (not tubing). Thick shell flange. Extra heavy duty shell end where the tip takes the mose abuse. Larger diameter decreases preheat time and maintains the cut on painted or rusty plates. Course "V" splines which cuts better, resists clogs and makes cleaning easier. Medium duty tips fit "Forney " 1680, 1702, 1705, 1707 and 1753 torch kits and "Victor" compatible equipment. Features copper shells machined from solid bar stock (not tubing). Thick shell flange. Extra heavy duty shell end where the tip takes the mose abuse. Larger diameter decreases preheat time and maintains the cut on painted or rusty plates. Course "V" splines which cuts better, resists clogs and makes cleaning easier. Heavy duty tips fit "Forney " 1711 torch kit and similar "Victor" compatible equipment. Features copper shells machined from solid bar stock (not tubing). Thick shell flange. Extra heavy duty shell end where the tip takes the mose abuse. Larger diameter decreases preheat time and maintains the cut on painted or rusty plates. Course "V" splines which cuts better, resists clogs and makes cleaning easier. Heavy duty tips fit "Forney " 1711 torch kit and similar "Victor" compatible equipment. Features copper shells machined from solid bar stock (not tubing). Thick shell flange. Extra heavy duty shell end where the tip takes the mose abuse. Larger diameter decreases preheat time and maintains the cut on painted or rusty plates. Course "V" splines which cuts better, resists clogs and makes cleaning easier. Heavy duty tips fit "Forney " 1711 torch kit and similar "Victor" compatible equipment. Features copper shells machined from solid bar stock (not tubing). Thick shell flange. Extra heavy duty shell end where the tip takes the mose abuse. Larger diameter decreases preheat time and maintains the cut on painted or rusty plates. Course "V" splines which cuts better, resists clogs and makes cleaning easier. Heavy duty tips fit "Forney " 1711 torch kit and similar "Victor" compatible equipment. An orifice/bore gas concentration nozzle. Fits "Forney", "Tweco" and "Clarke" style MIG guns. Suitable for medium to heavy duty applications. An orifice/bore gas concentration nozzle. Fits "Forney", "Tweco" and "Clarke" style MIG guns. Suitable for medium to heavy duty applications. One end has sharp blade with back bevel; other end tapers to a point. Flame treated hickory handle Sure-Lock wedged in tapered adze eye. Soft grip barrel handle. Lock-on switch. Die-cast aluminum gear housing. 2-position assist handle. Includes 4-1/2" grinding wheel, auxiliary handle and wrench. Tool less guard adjustment, heavy duty metal gear housing for added durability, compact grip design for comfort and control. Specs: 120V, 4-1/2" cut-off disc, no load RPM: 11,000. Includes: (1) metal grinding wheel, side assist handle, spanner wrench. Metal gear case for durability and longer life, convenient slide switch for easier use, two Position side handle provides added comfort and control, spindle lock for easy accessory changes, contoured body grip for added comfort and control. Specs: 10000 RPM, spindle size 5/8"-11. Includes: metal grinding wheel, spanner wrench. Cast metal gear case increases jobsite durability and tool longevity, Tool-free change guard provides fast and easy guard removal. Spindle lock feature allows for single wrench bit changes. 3-position side handle allows greater control in multiple positions. Specs: 11,000 rpm, 5/8" x 11" spindle and weighs 4.1 lbs. Includes slide switch with lock-on, side handle, grinding wheel, wrench and wheel guard. Slim body for a secure grip, metal gear case, tool less safety guard adjustments instantly, two position auxiliary handle, slide on/off switch, spindle lock for easy disc replacement, soft grip handle. Specs: 120V/60Hz,no load speed 11000 RPM, 4-1/2" disc, disc bore 7/8", spindle thread 5/8"-11, weight 4.2 lbs. Includes 10 ft. cord, (1) auxiliary handle, (1) spanner. Powerful motor for fast, efficient grinding, metal gear case adds durability and extends the life of the tool, extended handle for added comfort and control, trigger switch allows for ease of use when wearing gloves, three position side handle adds comfort and control. Specs: 10000 RPM, spindle size 5/8"-11. Includes: (1) metal grinding wheel, spanner wrench, side handle. Contains 2-each Forney 70853, White, 70856, Red, and 70858, Green; and 1-each 70854, Black, 70855, Blue, and 70857, Yellow. Made in USA. Great for indoor or outdoor holiday decorating, announcing special events, and many other uses. Temporary window marker for use on glass, metal, and most other non-porous surfaces. Weather resistant, dries quickly, and removes easily. To remove paint, spray with an all-purpose cleaner, briefly soak, and rub vigorously with a wet cloth or paper towel. Use only as directed. Not intended for use on clothing, convertibles or car paint, rubber, textiles, paper, and other porous surfaces. May stain clothing. "Victor" compatible oxygen-acetylene heating tip. Size 8 (8-MFA-1). Fits "Forney" 1680, 1702, 1705 (sku #: 890.9442), 1707 and 1753 (sku #: 891.2776) torch kits and "Victor" compatible light and medium duty equipment. High performance motor produces 8,500 rpm for aggressive cutting, removal and finishing. Cast metal gear housing helps dissipate heat during extended use. Contoured over molded handle optimized for increased comfort. Spindle lock allows for quick and easy wheel changes. 3 position side handle provides control in multiple positions. Tool free guard makes guard adjustments quick and easy. 20 volt max system - high performance cordless platform. 14" length; weighs only 5 lbs. Battery And Charger Sold Separately. Lock on/off switch for extended use applications, ServiceMinder brushes eliminates guesswork and stops the tool when preventative maintenance is required, epoxy coated field windings provides ultimate protection against abrasive dust and metal debris, 5/8"-11 spindle, spindle lock for quick wheel changes, two position auxiliary handle specifically designed and angled to a natural position, double insulated, UL listed, complies to OSHA. Specs: 120V/AC, 4-1/2" cut-off disc, max. motor HP 1, no load RPM 11,000, 5/8"-11 spindle thread, length 10-1/2", weight 3.75 lbs. Includes: guard, auxiliary handle, flange kit (inner and outer wheel flanges), spanner wrench, abrasive wheel. Labyrinth construction seals and protects the motor and bearings from dust and debris, all ball bearing design and metal gear housing, externally accessible brushes, protective varnish seals the armature, machined bevel gears, side handle is positioned at an increased 20 degree angle for comfort and control. Specs: 120V, 4" grinding wheel, sanding disc, 3" wire cup brush, no load speed 11,000 RPM, spindle thread m10x1.25", length 10-1/2", weight 3.7 lbs. Includes: 4" grinding wheel, wheel guard, lock nut, lock nut wrench, side handle, inner flange, plastic tool case. Spindle lock provides easy and quick disc changes, tool rest to protect the user and prolong tool life, slide switch with a quick-off feature to shut off the tool immediately, removable side handle, carbon brush access allows user to replace brush as needed, lightweight design facilitates maneuverability. Specs: 1,010 max watts out, no-load speed 11,000 RPM, 4.5" wheel diameter, slide switch, spindle thread M10 x 1-1/4, spindle lock, sealed switch, length 10". Includes: wrench, side handle, 5 depressed center wheel, plastic carrying case. Compact and light grinder features debris baffle which protects internal components, multi-port exhaust reduces motor burn-up, tool free and burst resistant guard. Specs: wheel diameter 4-1/2", slide switch, max watts out (power) 750, speed rpm 11000, 120V (AC only), epoxy motor protection, double insulated 8' cord, spindle thread 5/8-11", easy actuation spindle lock, length 10.25", weight 3.5 lb. Includes: grinder, 4-1/2" type 27 grinding wheel, type 27 guard, spanner wrench. (8 MFA). Fits Forney 1711 torch kit and Victor compatible heavy duty equipment. A light, ergonomic grinder with a slender grip circumference that allows users to work comfortable for extended periods. This 4.2 lb tool delivers plenty of power, with a 7.5 amp motor that produces 11,000 no-load rpm. It has directed air flow that diverts dust away from vital components. Bosch's Service Minder brush system shuts off the tool when preventative maintenance is required, which helps to eliminate guesswork. This grinder has a two position side handle. It has a burst protection quick adjustable guard designed for user protection, as well as a large spindle lock for easy disc changes. Includes (1) Auxiliary handle, (1) wheel guard, (1) flange kit, (1) spanner wrench and (1) 4-1/2" abrasive wheel. For sharpening, grinding, rust removal and surface preparation. Metal gear case adds durability and extends the life of the tool. 7 amp motor for fast, efficient grinding. Trigger switch allows for ease of use when wearing gloves. Extended handle with rubber grips for added comfort and control. 3 position side handle adds comfort and control in a variety of applications. Spindle lock. Easy accessory changes. 1,000 rpm. Spindle size: 5/8''-11''. Includes: 4-1/2'' small grinder, (1) metal grinding wheel, (1)spanner wrench and (1) side handle. Rotatable gear housing can be positioned every 90 degrees for cutting applications, grinder has externally accessible brushes, protective varnish seals the motor from contaminants and reduces heat, all ball bearing design and metal gear housing , machined bevel gears. Specs: 11,000 no load RPM, 5/8" x 11 spindle thread (UNC), 10-1/2" x 5" x 4-1/16" overall length, weight 3.1 lbs. Includes: 4-1/2" grinding wheel, sanding disc, 3-1/2" wire cup brush , wheel guard, lock nut, lock nut wrench, side handle, inner flange. Medium duty "Victor" compatible oxy-acetylene torch handle. Includes check valves. Two (2) stainless steel needle valves for fast accurate flame adjustment. Enhanced wall thickness provides strength and durability. No screws or soldered joints for enhanced durability and ease of maintenance. Made from tough extruded brass. Fits "Forney" 01680, 01705 (sku #: 890.9442) and 01707 torch kits. All ball bearing design and metal gear housing, rotatable gear housing can be positioned every 90 degrees, lock-on/off feature, AC/DC switch for use with alternative power source, protective varnish seals the armature from dust and debris, extra large paddle switch, thicker coil wires are wound more closely to reduce heat and energy loss. Specs: 120V, grinding wheel, sanding disc - 4-1/2", wire cup brush 3-1/2", no load speed 10,000 RPM, 5/8"x11 UNC spindle thread, length 10-5/8", weight 4.5 lbs. Includes: 4-1/2" grinding wheel, wheel guard, lock nut, lock nut wrench, side handle, inner flange. 17 cc's permanent opaque colors for most surfaces. All ball bearing design and metal gear housing, rotatable gear housing can be positioned every 90 degrees, lock-on/off feature, AC/DC switch for use with alternative power source, protective varnish seals the armature from dust and debris, extra large paddle switch, thicker coil wires are wound more closely to reduce heat and energy loss. Specs: 120V, grinding wheel, sanding disc - 4-1/2", wire cup brush 3-1/2", no load speed 10,000 RPM, 5/8"x11 UNC spindle thread, lock-on/lock-off, length 10-3/4", weight 4.5 lbs. Includes: 4-1/2" grinding wheel, wheel guard, lock nut, lock nut wrench, side handle, inner flange. Powerful 7.5 amp motor delivers 11,000 rpm for high output power. Small diameter barrel grip (only 2-1/2") for added comfort. Labyrinth construction seals and protects the motor and bearings from dust and debris for longer tool life. Extra large paddle switch for comfortable operation. Thicker coil wires are wound more closely to reduce heat and energy loss. All-ball bearing design and metal gear housing for durability. Rotatable gear housing can be positioned every 90?. Includes: (1) 4-1/2" Diamond Blade, Turbo, General Purpose (A-94552), (5) 4-1/2" Grinding Wheels (A-95956), (1) 4-1/2" Wheel Guard (125273-5), (1) 4-1/2" Cut-Off Wheel Guard (135103-2), (1) Lock Nut (193465-4), (1) Lock Nut (193465-4), (1) Lock Nut Wrench (782422-3), (1) Side Handle (153489-2), (1) Inner Flange (224399-1) and (1) Case. Designed for light and medium MIG and TIG applications to provide accurate flow of gas. Dual scale gauge with impact resistant polycarbonate lens and machined brass body for maximum durability. Includes adapter for 5/32" (4mm) gas hose. "Verstile Victor" compatible oxygen regulator for meduim duty applications. Forged brass bodies and bonnets for maximum strength. Sintered (heat-treated) metal inlet filter to trap impurities. Pressed, not soldered, joints for easy maintenance. Easy to read dual scale gauges with nearly unbreakable screw-on-lenses. Includes a safety relief valve for safe operation. Included in "Forney" 01705 (sku #: 890.9442), "Shop Flame II" and 01707 "Deluxe" Oxy-Acetylene Welding Kits. 11 amp AC/DC 11,000 rpm motor provides the ideal weight/size ratio available. Dust ejection system provides durability by ejecting damaging dust and debris particles that enter the tool. Oversized brushes provide long brush life. Large spiral bevel gear provides long transmission life. One-Touch guard allows for 360 degree rotation of the guard with a single action. Quick-change wheel release allows tool free wheel removal without the need for a wrench. Top mounted and protected spindle lock button maximizes depth of cut without compromising durability. Uniquely small gripping surface in this power class allows for ideal comfort. Newly designed side handle provides excellent ergonomics while oversized threading provides durability. Auto-off brushes shut the tool down when the brushes need replacing to avoid tool damage. Paddle switch with safety lock-off prevents accidental start up. Matching wheel flanges allow the use of common accessories. Lightweight at only 4.6 lbs. Tool length: 12". Spindle thread: 5/8"-11. Angle grinder includes: 2-position side handle and 4-1/2" One-Touch (T27) guard. Motor overload protection, epoxy protection extends motor life by protecting the copper wire from abrasion, debris baffles protect internal components by deflecting damaging debris out of the airflow, multi port exhaust reduces motor burn up by efficiently venting hot air out of the grinder, extra large paddle switch, tool free, burst resistant guard. Specs: 120V (AC only), 4-1/2" wheel diameter, speed (RPM) 10,000, slide switch, 5/8"-11 spindle thread size, spindle lock, side handle, 8' cord, max watts out (Power): 825 MWO, double insulated, easy actuation spindle lock, 8' 2-wire cord, Length 11.8", weight 5.0 lbs. Includes: (1) slide handle, (1) type 27 guard, (1) spanner wrench, (1) Flange. Dust ejection system through the air intake vents, low profile, one-piece brush arm, QuickChange wheel release allows wheel removal without need for a wrench, keyless adjustable guard, vibration reducing side handle, auto off brushes shut the tool down when the brushes need replacing to avoid tool damage, oversized, protected spindle lock button, paddle switch with safety lock-off prevents accidental start up, matching wheel flanges. Specs: max watts out 1,200W, HP 1.6hp, no load speed 11,000 RPM, use wheels RPM above 11,000 RPM, spindle thread 5/8"-11, paddle switch w/lock-on, dust ejection system, tool-free flange system, length 11-1/4", weight 4.6 lbs. Includes: two position side handle, depressed center wheel, keyless adjustable guard, wrench, kit box. Highest overload durability with an improved cooling mechanism, improved dust protection resists wear on the armature and field coils, on/off switch mounted on the top, one touch quick off mechanism, Easy to manipulate spindle lock located at the front of the grinder, side handle projects forward 70 degrees and can be attached to the right or left. Specs: 4-1/2" wheel diameter, 5/8" x 11 spindle, power source AC/DC, power input 910 W, max output 1,900 W, no load RPM 10,000, length 11-9/64", weight 4.2 lbs. Includes: spanner wrench, side handle, depressed center wheel. Trigger grip handle provides better control, debris baffles protect internal components by deflecting damaging debris out of the airflow at the intake vents, soft grip three position handle provides optimal control during various applications, external brush doors reduces service time by providing easy access to brushes, tool free, burst resistant guard quickly adjusts the guard without a tool. Specs: 120V (AC only), 4-1/2" wheel diameter, max. watts out (power) 1,250 MWO, load RPM 10,000, debris baffles, multi-port exhaust, tool free guard, gears spiral bevel, epoxy motor protection, multi-port exhaust system, burst resistant guard, 8', 2-wire cord, double insulated, 5/8"-11 spindle thread, weight 5.5 lbs. Includes: side handle, type 27 guard, spanner wrench, flanges. Victor compatible. Double o-ring seal for quick, leak-free, hand-tight connections. Head and body are made from forged brass for longer life. Fits Forney 01711 torch kit. 4 -pole motor delivers maximum power when cutting or grinding. Overload protection prevents damage to the tool and battery in abusive situations. Debris baffles L-shape vents keep debris from entering the tool and damaging internal components to help increase tool life. Tool free, burst resistant guard allows for quick, easy guard adjustments. 3-position side handle provides optimal control and versatility. Includes: (1) M18 Cordless Lithium-Ion 4-1/2" cut off grinder and (1) side handle. Cuts wood, metal, plastic, aluminum and ceramic tile with ease. Sets up in seconds. Weighs only 13 lbs. 5.5 amp motor; 2,800 spm. 3/4" stroke length using a "T" shank jig saw blade. Includes blade holder, (5) T-shank assorted blades and allen key. Forged brass bodies and bonnets for maximum strength. Sintered (heat-treated) metal inlet filter to trap impurities. Pressed, not soldered, joints for easy maintenance. Easy to read dual scale gauges with nearly unbreakable screw-on lenses. Victor compatible. Forged brass bodies and bonnets for maximum strength. Sintered (heat-treated) metal inlet filter to trap impurities. Pressed, not soldered, joints for easy maintenance. Easy to read dual scale gauges with nearly unbreakable screw-on lenses. Includes a safety relief valve for safe operation.Victor compatible. Trigger grip handle provides better control, debris baffles protect internal components by deflecting damaging debris out of the airflow at the intake vents, soft grip three position handle provides optimal control during various applications, external brush doors reduces service time by providing easy access to brushes, tool free, burst resistant guard quickly adjusts the guard without a tool. Specs: 120V (AC only), 4-1/2" wheel diameter, max. watts out (power) 1,250 MWO, load RPM 10,000, debris baffles, multi-port exhaust, tool free guard, gears spiral bevel, epoxy motor protection, multi-port exhaust system, burst resistant guard, 8', 2-wire cord, double insulated, 5/8"-11 spindle thread, weight 5.5 lbs. Includes: side handle, type 27 guard, spanner wrench, flanges. Powered by a Makita brushless motor for longer run time, increased power and speed, and longer tool life. For the most demanding applications. Ideal for grinding, cutting and sanding a wide range of materials including tile, concrete, pipe, conduit, and more. Automatic speed change technology adjusts speed and torque during operation for optimum performance. Active feedback-sensing technology (AFT) turns the motor off if rotation of the wheel is suddenly forced to stop. Rubberized soft grip provides increased comfort on the job. Slide switch with lock-on for operator convenience. 3-stage LED gauge indicates battery charge level. Specs: no load speed 8,500, spindle thread 5/8 -11, weight 5.8 lbs, length 14-1/4". Includes: (1) Grinder Tool, (1) 5" x 1/4" x 7/8" INOX Grinding Wheel - 36 Grit, (1) 5" Ultra Thin Cut-Off Wheel, (1) Side Handle, (1) Lock Nut Wrench, (1) 5" Cut-Off Wheel Guard, and (1) 5" Tool-less Wheel Guard. Battery and charger not included. This Angle Grinder with Paddle Switch is a beefy angle grinder that provides a no-lock multi-grip paddle switch for user control and comfort. Delivers 13 amps and up to 11,500 rpm of professional power. Variable speed setting of 2,800 rpm, allowing the user to match speed to application. The paddle switch provides additional operator control. The tool is designed for long life, featuring directed air flow that diverts dust away from vital components. Equipped with a two position Vibration Control side handle, making it less strenuous to operate. Constant electronics for easy starts and dependable speed under load, and it has direct motor cooling for higher overload capabilities. Provides security, with integrated acceleration sensor to limit inadvertent recoil and restart protection to protect against unintended startup. Burst-protection quick tool-less adjustable guard and a large spindle lock for a more convenient disc change. The Service Minder brushes stop the grinder when preventative maintenance is required. Lightweight, lock-on button for continuous use operation, side handle can be installed on either side of the tool, ball bearing construction for long tool life, spindle lock for easy wheel changes, AC/DC for use with alternative power source, standard 5/8?x 11 UNC spindle, double insulated. Specs: 115V, 5" grinding wheel, 3-1/2" wire cup brush, 5" sanding disc, no load speed 10,000 RPM , 5/8" x 11 UNC, spindle thread, lock-on, length 14", weight 6.6 lbs. Includes: (1) grinding wheel, wheel guard, side handle, inner flange, lock nut, lock nut wrench, spindle washer. For cutting and grinding applications. Spec: quick-change wheel, tool free guard, 2-finger trigger switch with lock-off button, 2-position side handle, 6,500 rpm, spindle lock, 5/8" spindle thread, and weighs 5.1 lbs. Uses wheels above 10,000 rpm. Includes tool only with spanner wrench, type 1 (cutting) guard and 2-position side handle. Uses 20V MAX Lithium Ion. Battery not included. Powerful 15 amp motor with 1.2 amp no load speed makes this a great machine for the workshop or the jobsite. Throat depth=16"; Stroke=4/5"; Cutting depth=2"; Table bevel =0-45 degrees left; Weight: 30.8 lbs; Dust blower; Dust port; Blade guard; Variable speed. Accessories include ; Blade guard; Blade holder; Allen key; 2 blades:(1) 15 TPI;(1) 18TPI; Includes 6 each "Forney" 70824 (sku #: 891.5100) and 70825 (sku #: 891.5118); 8 each - 70820 (sku #: 891.5084) and 70822 (sku #: 891.5092); 10 each - 70818 (sku #: 891.5068) and 70819 (sku #: 891.5076); plus FREE 6-Chamber display. Super joint system helps prevent gear damage caused by accidental wheel binding. Variable speed control dial enables user to match the speed to the application. Powerful 12.0 amp motor for increased output power in a more compact tool. Soft start feature for smooth start-ups. Labyrinth construction seals and protects the motor and bearings from dust and debris for longer tool life. Electronic speed control maintains constant speed under load. Larger and improved carbon brush material for longer tool life. Tool-less wheel guard adjustment for easy clamping.3-1/2" wire cup brush, 4-1/2" sanding disc. No load speed 2,800-10,500 rpm. 5/8" x 11 UNC spindle thread. Dimensions: 11-3/4"L x 5-1/15"W x 4". Weighs only 5.3 lbs. High power 8,500 rpm motor with overload protection provides higher operating speeds under load. Epoxy coated field armature provides long service life against abrasion from airborne debris. Low profile gear case allows for work in tight areas. Automatic turn-off brushes shut down the tool when brushes need to be changed to avoid tool damage. Side handle provides improved ergonomics for specific applications. Brush window allows for quick brush replacement. Specs: 3,000 Watts, 4 HP. Includes: 7" guard and 2 position side handle. Debris baffles protects internal components, external brush doors reduces service time by providing easy access to brushes, soft grip main handle, burst resistant guard, adjust the guard without a tool, 7" and 9" type 27 guard included for added productivity. Specs: 120V (AC/DC), wheel diameter 7?/9?, trigger w/ lock-on, max watts out (power) 3,130, no load RPM 6,000 , multi-port exhaust, tool free guard, 4.2 HP max horse power, use wheels RPM above 6,600, gears spiral bevel, epoxy motor protection, multi-port exhaust system, spindle thread 5/8"-11 , double insulated, 8' 2-wire cord, easy actuation spindle lock, length 21", weight 13.7 lbs. Includes: grinder, side handle, 7" & 9" type 27 guards, spanner wrench, flanges. 4-1/2" - 6" (115mm-150mm) Grinder with KicBack brake is maximized for power and durability. It delivers 13 amps of power with the portability and convenience of cordless through Dewalt's revolutionary FlexVolt technology. The rake engages when the trigger is released, stopping speeds of 1.5 seconds with standard grinding wheel (4-1/2" x 1/4" Bonded abrasive wheel, non-hubbed). KicBack brake engages when a pinch, stall or even bind up event is sensed and the electronic brake engages with maximum force to quickly stop the wheel, reduce the movement of the grinder and shut the grinder off. E-Clutch activates in less than a tenth of a second when a pinch/stall is detected, shutting down the motor. 9,000 rpm speed allows the use of up to 6" wheels for both cutting and grinding applications. Includes: Grinder, side handle, 4-1/2" (115mm) Type 27 wheel, 4-1/2" (115mm) Type 27 guard, 6" (150mm) Type 27 guard, wrench and flanges. Battery Not Included. Variable electronic speed, slender double-neck die cast aluminum gear housing, Internal labyrinth construction, speed control dial, SJS (Super Joint System) absorbs shocks, wheel lock. Specs: collet 1/8" - 1/4". no load speed 7,000 - 28,000 RPM. 115V, overall length 14-5/8". Includes: 1/4" collet cone , side handle, wrench #13 , wrench #19. Metabo long life motor with more torque, power and higher overload capacity. 9,600 rpm with Electronics, lock-on. Metabo S-Automatic safety clutch reduces the chance of kick-back jams. Electronic speed stabilization maintains the speed of the tool under heavy operating conditions. M-Quick wheel change system. "Victor" compatible medium duty oxy-acetylene welding kit. Welds up to 3/8" (9.52mm) and cuts up to 6" (152.4mm). Provided with check valves for safety. Has 3/16" (4.76mm) x 20' (6.1m) T-grade hose. Ideal for maintenance, fabrication, plumbing and do-it yourselfers. Kit includes: Oxygen Regulator (SKU #: 891.2677); Acetylene Regulator (SKU # 891.2685); Torch Handle (SKU # 891.2701); Cutting Attachment (SKU # 891.2693); Goggles (SKU # 891.0036); Flint Lighter (SKU # 891.2586); T-Grade Hose (SKU # 891.5373); Cutting Tip #0 (SKU # 891.0812); Welding Tip #0 (Forney #87822); Check Valves (Forney #87151). Slim-housing, short length and lightweight design fits into tight spaces and reduces user fatigue. Electronic Cell Protection monitors battery to prevent damage in heavy duty applications. Slim-mount guard design allows deeper cuts and full usage of accessory. Overload protection and lifetime brush design creates long motor life without need to change brushes. Burst wheel resistant guard design resists rotation. Restart protection prevents start-ups if switch is locked on during battery insertion. Soft-start electronics for smoother start ups. Specs: 4-pole open frame motor, 10,000 rpm. Includes 2 FatPack lithium-ion battery, charger, cut-off wheel, 2 guards, flange kit, and auxiliary handle. The 60 volt 4-1/2" - 6" (115mm-150mm) Grinder with Kickback Brake is maximized for power and durability. It delivers 13 amps of power with the portability and convenience of a cordless. The Kickback brake engages when a pinch, stall or bind-up event is sensed and the electronic brake engages with maximum force to quickly stop the wheel, reduce the movement of the grinder and shut the grinder off. 9,000 rpm speed allows the use of up to 6" wheels. The E-Clutch activates in less than a tenth of a second when a pinch/stall is detected, shutting down the motor. Comes with (1) 60V Max Lithium Ion battery and (1) fast charger. 7,000 rpm motor provides high power for cutting and grinding applications. Quick-Change wheel release allows for tool free wheel change without the need for a wrench. Tool free guard allows for quick, easy guard adjustment/positioning. 2 finger trigger switch with lock-off button allows for convenient activation and easier gripping. 2 position side handle offers greater control, comfort and versatility. 5/8-11 spindle lock; 5/8-11 spindle thread. Includes grinder, (2) Premium Li-Ion batteries, a fast charger, spanner wrench, 5" type 27 (grinding) guard, 2-position side handle and a contractor bag. Brushless motor requires no brush changes. Kickback brake engages when a pinch, stall or bind-up event is sensed and the electronic brake engages with maximum force to quickly stop the wheel, reduce the movement of the grinder and shut the grinder off. Two stage trigger requires two actions to activate tool. Brake stops wheel in 2 seconds or less on average. Features E-Switch protection; when the on/off trigger switch has no volt release function. In the event of a power outage or other unexpected shut down, the trigger switch will need to be cycled (turned off and then on) to restart the tool. Also included with the Grinder: a side handle, hex key, inner and outer flange, 4.5" type 27 guard, charger, (2) 6.0 AH batteries and a handy kit bag. "Victor" compatible lightweight torch kit that welds up to 1/2" (12.7mm) and cuts up to 4" (101.6mm); ideal for auto repair, plumbing, refrigeration, metal art, general and industrial maintenance; easy to store and can be carried from job-to-job; all accessories fit comfortably in a light sturdy plastic tote; all tanks are shipped empty per DOT regulations. Kit includes: Oxygen Regulator (Forney #86230); Acetylene Regulator (Forney #86229); Torch Handle (sku # 891.2701); Cutting Attachment (sku # 891.2693); Goggles (sku # 891.0036); Flint Lighter (sku # 891.2586); T-Grade Hose (sku # 891.5373); Cutting Tip #0 (sku #891.0812); Welding Tip #0 (Forney #82822); Oxygen Cylinder (Forney #86224); Acetylene Cylinder (Forney #86228); Check Valves (Forney #87151); Plastic Tote (Forney #86221). Cuts up to 1/4 in. of mild steel. The 60 volt 4-1/2" - 6" (115mm-150mm) Grinder with Kickback Brake is maximized for power and durability. It delivers 13 amps of power with the portability and convenience of a cordless. The Kickback brake engages when a pinch, stall or bind-up event is sensed and the electronic brake engages with maximum force to quickly stop the wheel, reduce the movement of the grinder and shut the grinder off. 9,000 rpm speed allows the use of up to 6" wheels. The E-Clutch activates in less than a tenth of a second when a pinch/stall is detected, shutting down the motor. The brake engages when the trigger is released, stopping speeds of 1/5 seconds with standard grinding wheel (4-1/2" x 1/4" Bonded abrasive wheel, non-hubbed. 1700 max watts out. Comes with (2) Flexvolt batteries, (1) fast charger and (1) kit bag. Delivers maximum power when cutting or grinding with a 4-pole motor, overload Protection, debris baffles, Burst Resistant Guard allows for quick, easy guard adjustments, paddle switch, 35 percent faster cutting speed, 50 percent more cuts on a single charge, three position side handle. Specs: 9,000 RPM, paddle switch, tool free guard, large button spindle lock, 3 position handle, type 1 guard, type 27 guard, Lithium-Ion battery, weight 5.9 lbs. Includes: (2) 18V XC high capacity Lithium-Ion batteries, (1) one hour charger, type 1 guard, type 27 guard, type 1 cut-0ff wheel, spanner wrench, side handle, contractor bag. "Victor" compatible heavy duty oxy-acetylene welding kit. Welds up to 1/2" (12.7mm) and cuts up to 8" (203.2mm). Provided with check valves for safety and includes a 1/4" (6.35mm) x 20' (6.1m) T-Grade hose. Ideal for maintenance, fabrication, plumbing and do-it-yourselfers. Provides high performance at a very economical price. Kit includes: Oxygen Regulator (SKU # 891.5399); Acetylene Regulator (SKU # 891.5415); Torch Handle (SKU # 891.5431); Cutting Attachment (SKU # 891.5464); Goggles (SKU # 891.0036); Flint Lighter (SKU # 891.2586); T-Grade Hose (Forney # 86164); Cutting Tip #1 (SKU # 891.0887); Welding Tip #1 (Forney # 87833); Welding Tip #3 (Forney # 87835); Welding Tip #5 (Special Order only); Rosebud Tip #8 (SKU # 891.5472); Check Valves (Forney # 87151); Tip Cleaner (SKU # 891.2610). Providing high performance, advanced ergonomics & legendary durability, this grinder is designed to complete the toughest grinding, surface preparation, and cutting applications with any 7" - 9" accessory. The POWERSTATE brushless motor provides 6,600 RPM and higher speeds under load for corded grinding/cutting performance. REDLINK PLUS intelligence ensures maximum performance and protection from overload, overheating and over discharge. The M18 Red Lithium high output HD12.0 battery delivers unmatched run-time in all applications. Tool-free accessory changes using the FIXTEC nut and guard adjustments mean less downtime during work. Specs: 6600 RPM, 7"/9" wheel diameter, 5/8"-11" spindle. Includes: (1) 18 volt M18 FUEL 7"/9" Large Angle Grinder, (1) M18 Red Lithium high output battery pack, (1) M18 & M12 Rapid Charger, (1) 9" T27 guard, (1) anti-vibration side handle, (1) back flange, (1) dust vent clip, (1) FIXTEC nut and spanner wrench. Double parallel link arm design dramatically reduces vibration and noise, for extremely accurate cuts. Exclusive tool-free blade clamps, On-off switch, electronic variable speed, flexible dust blower and blade-tensioning lever are all located on the front upper arm. Arm design pivots from the back of the saw to the front and lifts so blade can be easily threaded through the material for inside cuts. Unique arm design keeps the blade perpendicular to the work. Oversized, cast-iron table provides excellent material support and bevels 45 degrees left and right. Specs: Motor 1.3 amp rating, 120V AC. 400-1,750 cutting strokes per minute. Table size 16" x 23-3/4". Weighs 56 lbs. Meets OSHA standards, CSA approved and U.L. Listed. Stand Not Included. Uses an electrical arc and compressed air to cut steel, aluminum and other conductive metals. Drag Torch technology allows you to move (drag) the torch directly across the metal surface for more precise cuts with or without a template. Designed to cut up to 1/8" (3.18mm) mild steel (excels at cutting sheet metal). Can sever up to 1/4" (6.35mm) steel. Uses standard household 115 VAC current. Includes Torch with 13.2' (4m) lead; 13.2' (4m) Ground Cable with 200 Amp Ground Clamps; and 7.4' (2.25m) Input Power Cable with 15 Amp NEMA 5-15P Plug. Plasma Cutter comes with a built-in piston driven compressor and lightweight inverter power supply; Thermal Overload Protection (rated for 35% duty cycle at 104 degrees F (40 degrees C)); Three (3) Diagnostic LED lights (power, temperature, & torch energized/ready to work); and Post-Flow air cooling (cools torch and tip after cutting). CSA certified. Specifications: Input: 120 VAC; 60 HZ; 12 Amp; 1-Phase; Output (Fixed): 25% @ 12 Amp; Absorbed Power: 22.5 Amps; Weight: 35 Lbs. (15.88Kg).